Nicholas Sinclair (Richard Keats) is a scientist working with others to locate and eradicate the source of a plague that has devastated the world. Their brilliant plan is to locate the origin of the disease at some point in the past and send back an Advanced Prototype EXploration unit (or a robot if you prefer) to blow it up. When an A.P.E.X. sent to 1973 threatens an innocent family, Sinclair travels back to stop it, but when he returns to his time the whole world has changed for the worse. Initially, A.P.E.X. is mildly intriguing; the overarching threat is a mysterious disease that can apparently only be dealt with by sending killer robots through time. This flips the whole Skynet narrative on its head, ‘What if the evil force of the future is really trying to stop things from getting worse?’ The story jumps to 1973 and I thought that it would be novel to have a Terminator rip-off that spent some time in the early 1970s. 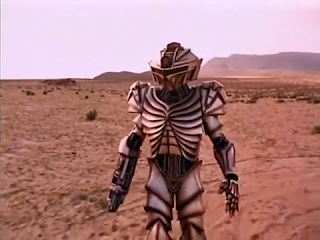 None of this really matters after about fifteen minutes as we are whisked back to 2073 for a solid hour of marching around the same brown wasteland shooting at robots. A.P.E.X. 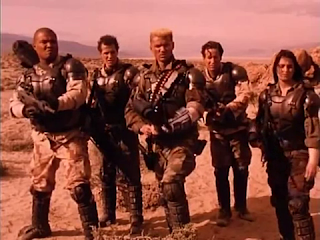 could still salvage its transformation into yet another futuristic war movie by having some interesting characters that we care about, but it fails here too. Sinclair is saddled with a bunch grouchy whiners who really have nothing else to do but yell and threaten one another. I hoped that maybe they would bond in the face of adversity but they remain jerks to one another the entire time, and I eventually stopped caring if any of them lived. Thankfully most of them do not. "SHOUT FORCE IS READY FOR ACTION!" 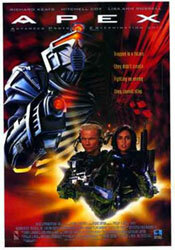 You are watching a killer robot movie mainly for the killer robots. A.P.E.X. only has one model of machine to offer and you only ever two on screen at the same time, but they are reasonably cool looking. They whir and clank like they stepped out of a 1950s movie, but that is charming in its own way. Any menace they might have is completely undercut by the fact they are terrible shots, and only manage to hit a target after a good twenty plus rounds are fired. To drag things out even further, it takes twice that many shots from our heroes to blow up an A.P.E.X. bot. So the majority of the movie feels like you are watching characters stand in one place and endlessly shoot at one another. It might pad the runtime out but it doesn’t make for compelling viewing. 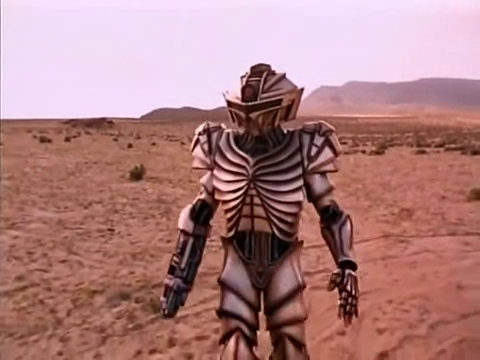 An android stands alone somewhere in Nebraska. If you’ve never seen a time travel movie before the ultimate revelation about the source of the mystery disease might come as a surprise, but even then I doubt it. To further insult the viewer, some potentially interesting paradoxes of the story are handwaved away quickly with a voice over. A.P.E.X. had some potential but it falls down and just becomes yet another cost-effective action movie set in a desolate wasteland. If you are hard up to see some robots stomp around and shoot at soldiers you might find some enjoyment here, but I suspect that most viewers will want to spend their time more wisely.